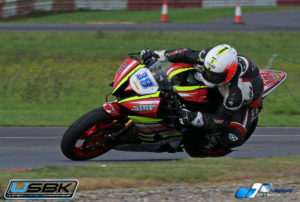 Carrying on his winning form from a couple of weeks ago at Kirkistown Jason Lynn put on another dominant show at Bishopscourt Racing Circuit at the weekend. 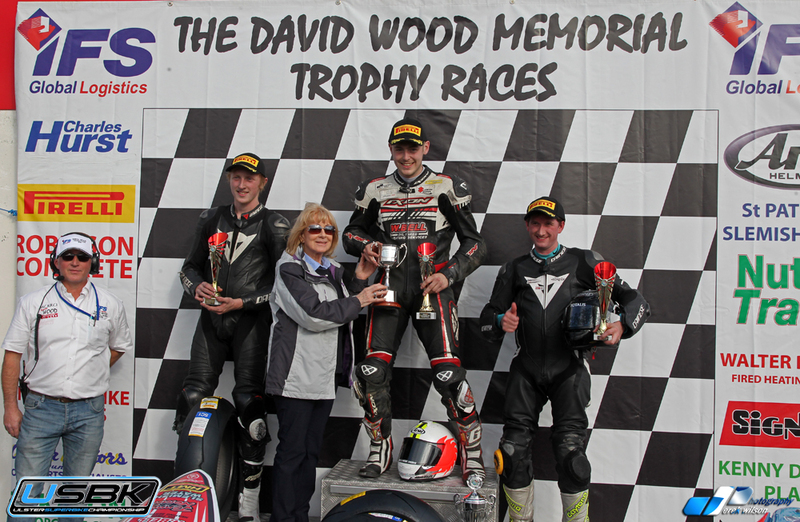 Winning all three of the two day meetings Supersport races he retained the David Wood Memorial Trophy and the Man Of The Meeting award. 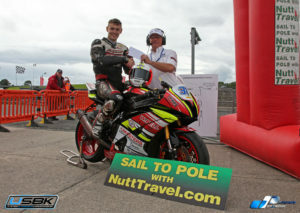 His successful weekend started when he won the Nutt Travel Sail To Pole shoot out putting his Walter Bell Yamaha on the front of the grid. Saturdays opening seven lap race he got swamped at the start as Kia McGreevy got the hole-shot off the line. By the end of lap one he had regained the lead which he held reasonably unhindered taking the win 4.7 seconds ahead of McGreevy in second and Christian Elkin in third. In his first outing on Sunday Lynn again had a bad start dropping back into fourth place, he battled his way back into the lead on lap three this time the winning margin was just over seven seconds at the end of the twelve laps, Kia McGreevey showing good pace again took the runner up spot Supersport Cup rider Simon Reid putting in a great performance was third on the road Mark Conlin the third Supersport machine to take the flag. In the third race Lynn was again in a league of his own, McGreevy took the lead off the line as he had done in the previous outings but his under powered Honda was no match for Lynns Walter Bell Yamaha on the straights and again he quickly took lead. taking his third win of the weekend by 5.4 seconds in front of McGreevy and Elkin claiming the final podium place. 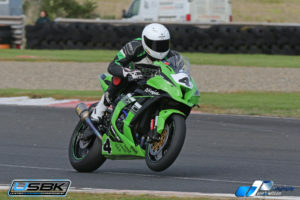 Randalstowns Gerard Kingahan had two wins from three starts in the Superbike races. The first two races were some of the closest racing of the weekend between him and Ali Kirk. Race one Kirk had the lead for the opening three laps until Kinghan made his move to the front. The pair never more than a bike length apart circulated the Bishopscourt circuit with only 0.77 seconds separating them at the flag. Ryan Gibson finished in third. Sundays opener and it was Kinghan who took the lead on the opening lap, Kirk tried everything to get past, but Kinghan never gave an inch and held the lead of another closely fought battle to the flag this time the pair only separated by 0.274 seconds. Ryan Gibson had his second podium finish of the weekend finishing third. Race three Kinghan was denied a hat-trick of wins when he got a bad start off the line dropping him back down the field. He made a gallant effort to regain the lost ground but Kirk was on a flier and was never going to be caught spoiling Kinghans perfect weekend taking the win by 8.4 seconds. Aaron Armstrong had a strong finish in third. With two wins and a runner up Kinghan won the Joe Lindsay Memorial Cup. He also secured the 2018 Ulster Superbike Championship with two race meetings, St Angelo and the Sunflower left. 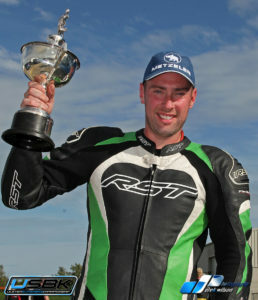 Simon Reid won all three of the Supersport Cup races. 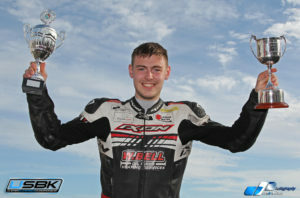 Fresh from winning the Irish 125 National road racing championship last week at the East Coast Racing Festival Paul Robinson also had a hat-trick of wins. 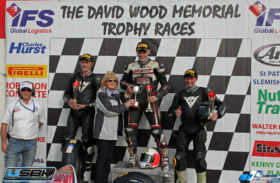 Denver Robb, Gary McCoy and Mark Hanna had a win a piece in the Supertwin races. Jonny Campbell and Joshua Rae had three wins each in the Junior Cup and Young Guns challenge races.